US Smooth Jazz is an American smooth jazz website supporting artists of this genre and their music. That way musicians have the great opportunity to publish their music at no charge for three months and become known by the audience. 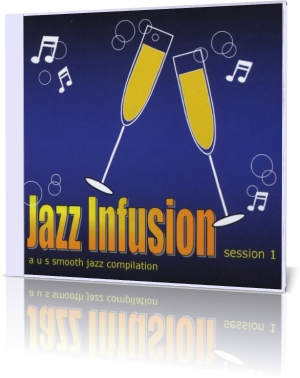 Jazz Infusion Session 1 is the first US smooth jazz compilation available at CDBaby presenting a selection of some of the currently portrayed artists. The album can also be downloaded at iTunes. Hailing from London UK keyboard player, producer, arranger, composer James Colah is on the start of his smooth jazz career. All signs are on green, that we can listen to his first solo album in the not too distant future. His contribution is entitled Better Days, which we interpret as a realistic wish. Multi-instrumentalist Colah delivers the perfect flow with his appealing guitar and the awesome piano line. Marcus Anderson indicates That's The Way It Goes. Inspired by Kirk Whalum and Everette Harp saxman Anderson showcases on his song taken from his debut album My Turn (2005) his instrumental skills and his will to success. His sophomore album From The Heart was released in 2009. Both are available at CDBaby. Always High Reaching is the impetus of high-energy formation Everett B Walters. Guitarist Michael Everett and bassist Harold Walter Brown present their stellar music influenced by EWF featuring keyboardist Brian Simpson with crispy piano notes. Philadelphia based group Zoé has with Let's Fly the same intention. Taken from their third same-titled album the song enthuses with a lively, intense and emotional twist. Time for Zoé to spread their music worldwide. Vision Jazz is formed by drummer Burt Shur and keyboardist Chuck Leichner. Their track Craig's Destiny from their album Distant Visions (2009) is established in contemporary jazz and fusion jazz featuring veteran saxman Greg Vail. Too ambitious and highbrow for your typical entertainment but something valuable for all jazz friends. The After 5 Jazz Ensemble are Jack Rock (piano), Frank Tatarelli (sax), Dennis Biernott (percussion) and John Kata (bass). Rooted in classic jazz they offer with Rising Tide a pleasurable variant. Freeway is Deon Yates' offering. This tune is a song from his debut album In Time (2009) displaying the saxplayer in strong reverb. The Uptown Band featuring Erich Cawalla and Jenifer Kinder present an adult contemporary mix of pop, funk, rock, soul, reggae and r&b. From their debut album Waiting For Her they showcase the title song. Always celebrating a great show this group exposes a powerful range between the styles of Mariah Carey and David Sanborn. Saxophonist John Rekevics, keyboardist John Cain, vocalist Craig Montgomery, and George on bass and vocals, that are GTF. From their debut album Always (2008) they mesmerize with Daybreak. Certainly the strongest piece of their album and the ultimate groove. While Australian Elizabeth Geyer already excels with her third album On Patrol With The Jazz Police (2008), she still fascinates with her work The Dream (2004), a collaboration with award winning multi instrumentalist Tony King. Elisabeth has a performance degree on trumpet from the Adelaide University, but her best instrument is her voice. Jazz Infusion - Session 1 is a multi-colored presentation of many talents from all parts of the world. Different in styles all artists have a common denominator, the desire to entertain.